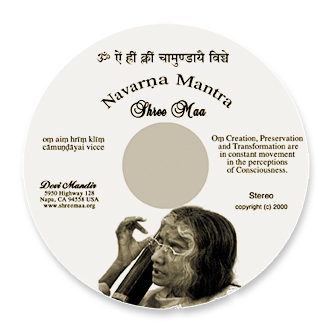 The Navarna Mantra is the root mantra of the Chandi Path. Om Aim Hrim Klim Camundayai Vicce. Aim is Mahasaraswati, representing creation. Hrim is Mahalakshmi, representing circumstance. Klim is Mahakali, representing dissolution. Chamunda is the slayer of Passion and Anger, and Chamundayai means moving in the paradigm of reality. Vi means the Sam Vit, or all that is knowable. Che is Chaitanya, representing Consciousness. Shree Maa’s chanting of this mantra can bring the listener deep into meditation. This mantra is SOOOOO powerful! Thank you Swamiji for the translation! Thank you Shree Maa for this enlightening recitation!